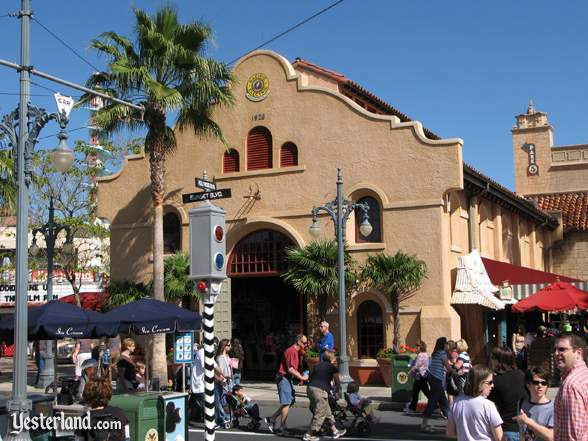 Its now Disneys Hollywood Studios, but it was Disney-MGM Studios when it opened in 1989. 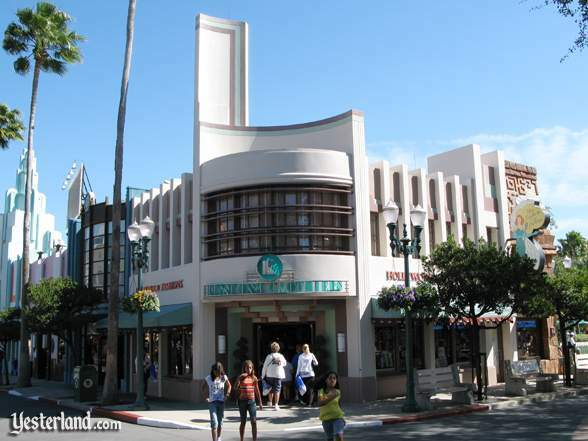 Last year, I published Real Buildings that Inspired Disney-MGM Studios, Part 1, comparing five Disney versions to the actual Los Angeles area “originals.” Heres Part 2, with six more buildings. Watch for Part 3 next week. 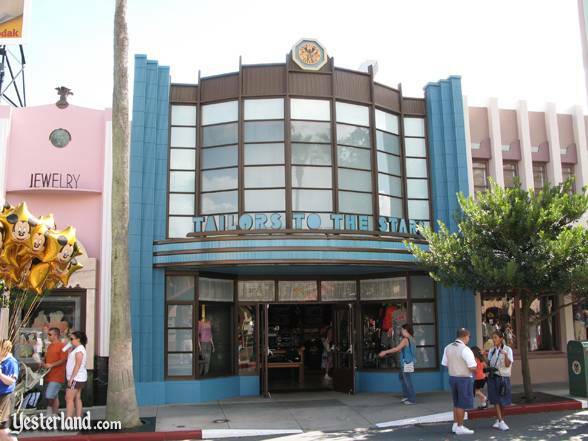 Tailors to the Stars is one of five façades with entrances into the Keystone Clothiers store. Inside, its a single large space with classic Art Deco style designs throughout. The store sells Disney tee-shirts and fancier Disney fashions. The Los Angeles Department of Water and Power still uses this regional office serving the Lincoln Park neighborhood of the city of Los Angeles. This gorgeous example of the Art Deco style has a bronze door and a sign with green iridescent glass letters. 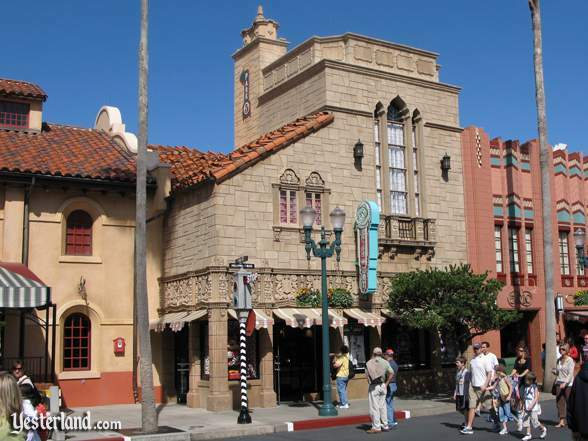 It was designed in the early 1930s by S. Charles Lee, famed theater architect of the Max Factor Building (below) and Los Angeles Theatre, the inspiration for the Hyperion Theatre at Disneys California Adventure. Apparel, Accessories, Jewelry is another of the five façades that provide entry into the Keystone Clothiers store. 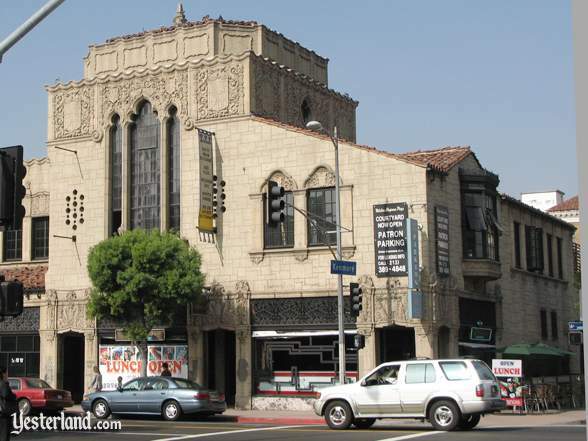 In 1931, movie make-up pioneer Max Factor hired theater architect S. Charles Lee to transform an ordinary building into this regal-looking Regency Deco style building. The Max Factor Company no longer occupies the building. The one-story portion is now Mels Drive-In, a 1950s-nostalgia restaurant. The four-story portion, which inspired the Role Models façade at Disneys California Adventure, is now the Hollywood Museum. Three of the five entrances into the triangular Keystone Clothiers building are corner entrances. The one facing the parks central plaza is a based on a real building. The other two are amalgamations of various building—a blue Streamline Moderne style tower and a wild Mesoamerican Revival style façade. The picture above also appears in the Yesterland article Real Buildings that Inspired Disneys California Adventure, Part 2. Its the Owl Drug Company Building (1933), designed by the firm of Morgan, Walls and Clements. 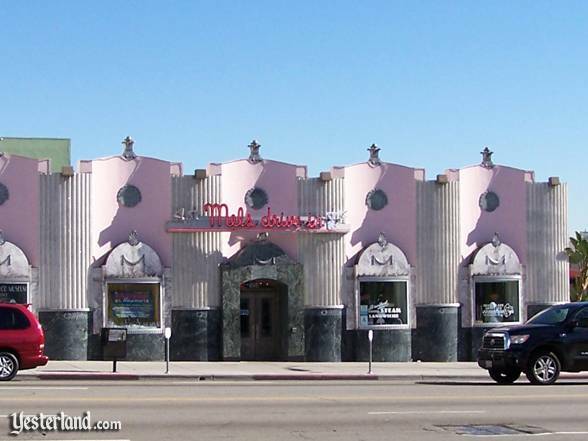 The drug store is out-of-business, but the building at the busy corner of Hollywood Boulevard and Cahuenga Boulevard is still a great example of the Streamline Moderne style. 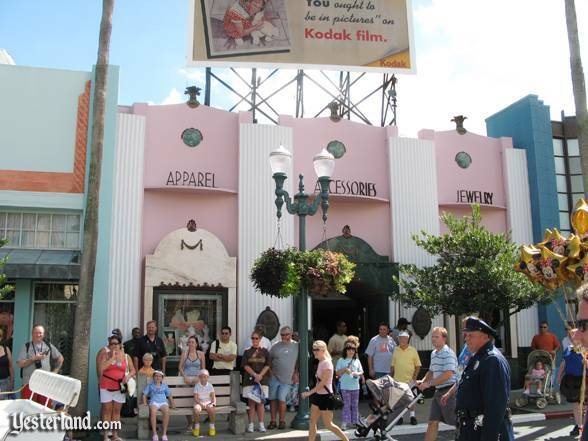 This location was Sweet Success, a candy store, when Disney-MGM Studios opened in 1989. Today, its Adrian and Ediths Head to Toe, which sells custom-embroidered Disney character goods. The stores name is a tribute to two legendary Hollywood costume designers. Adrian (1903-1959), usually listed in movie credits as “Gowns by Adrian,” had an illustrious career which included designing Dorothys Ruby slippers for The Wizard of Oz (MGM, 1939). Edith Head (1897-1981) was honored by the Motion Picture Academy with 35 nominations and eight Oscars—more Oscars than any other woman. The Chapman Park Market was one of the first West Coast markets designed specifically for customers arriving by automobile. Architect Stiles Clements of Morgan, Walls & Clements is responsible for this 1929 Spanish Colonial Revival style complex with extensive Churrigueresque detailing. It now serves Los Angeles vibrant Koreatown neighborhood. 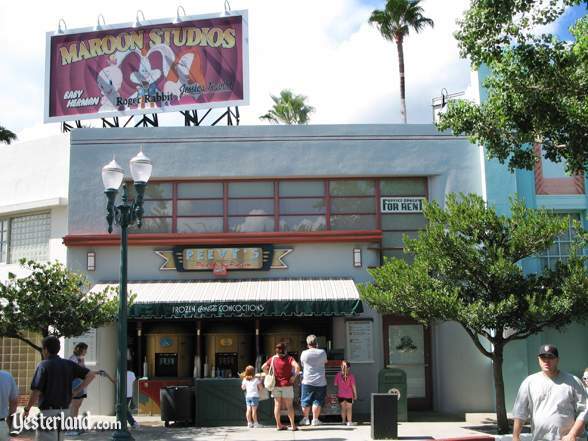 When Disney-MGM Studios opened in 1989, this location was Lakeside News, a newsstand selling comic books and other publications. Later, it became Peevys Polar Pipeline, featuring “Frozen Coca-Cola Concoctions”—Cosmic Coca-Cola, Fanta Blue Raspberry, MinuteMaid Raspberry Lemonade Launcher—as well as regular soft drinks, water, and snacks, Its named after A. “Peevy” Peabody, a character played by Alan Arkin in The Rocketeer. Touchstone Pictures (Disney) released The Rocketeer in June 1991, about two years after the opening of Disney-MGM Studios. The inspiration: Fire Station No. 1, 2230 Pasadena Avenue, Lincoln Heights. 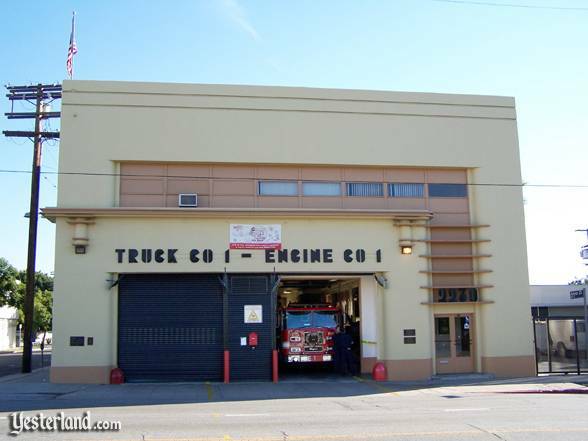 Built in 1940, this fine example of Streamline Moderne architecture is still a Los Angeles fire station today. L.A. Prop Cinema Storage sells Disney character merchandise for children, including apparel, plush, toys, dolls, souvenirs, and Mr. Potato Head parts. Above the entrance, theres a round Pacific Electric Railway sign. In the 1988 film Who Framed Roger Rabbit, Judge Doom plots to replace the Pacific Electric Railway with freeways, built by his Cloverleaf Industries. The Mission Revival style Ivy Substation was built in 1907 as one of the electric substations to convert A.C. power to D.C. power for the real Pacific Electric Railway Company. Yes, the Los Angeles region really was once blanketed by an extensive interurban rail system. This is an example of a building that probably looks much better now than when the Imagineers were looking for inspiration. 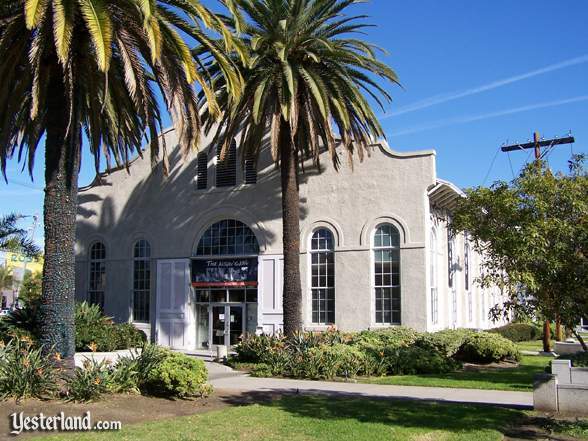 The Culver City Redevelopment Agency renovated the structure in 1992 as a live theater. The award-winning Actors Gang is the resident theater company. Another Pacific Electric substation, the Olive Substation at 2798 Sunset Boulevard, might be another model for L.A. Prop Cinema Storage. Built in the same general style as the Ivy Substation, the Olive Substation has windows that are more like those of L.A. Prop Cinema Storage. Ive always enjoyed walking down Hollywood Boulevard at the Studios park. But it wasnt until put together this series of articles that I really gained an appreciation for how carefully the Imagineers had designed the street and how skillfully the project had been carried out. A little more than five years after designing Hollywood Boulevard for the Studios parks 1989 opening, the Imagineers designed another street—Sunset Boulevard. And thats the subject of Part 3. Photo of Tailors to the Stars on Disneys Hollywood Boulevard: 2007 by Werner Weiss. Photo of Municipal Light, Water, Power in Lincoln Heights: 2007 by Chris Bales. Photo of Apparel, Accessories, Jewelry on Disneys Hollywood Boulevard: 2008 by Werner Weiss. Photo of Adrian and Ediths Head to Toe on Disneys Hollywood Boulevard: 2008 by Werner Weiss. 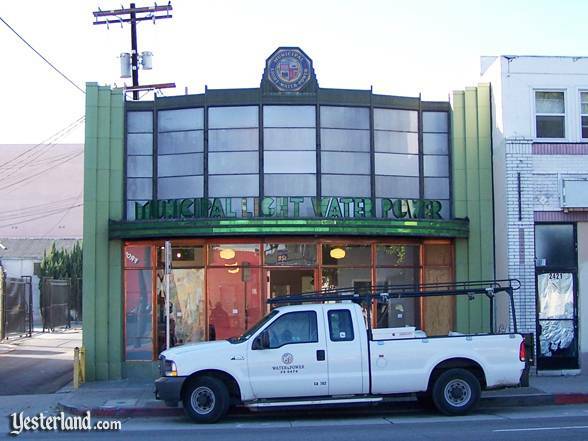 Photo of Chapman Park Market Building in Los Angeles: 2007 by Werner Weiss. Photo of Peevys Polar Pipeline on Disneys Hollywood Blvd: 2007 by Werner Weiss. Photo of Fire Station No. 1 in Lincoln Heights: 2007 by Chris Bales. Photo of L.A. Prop Cinema Storage on Disneys Hollywood Boulevard: 2008 by Werner Weiss. Photo of Ivy Substation in Culver City: 2007 by Chris Bales. Photo of Keystone Clothiers on Disneys Hollywood Boulevard: 2008 by Werner Weiss. 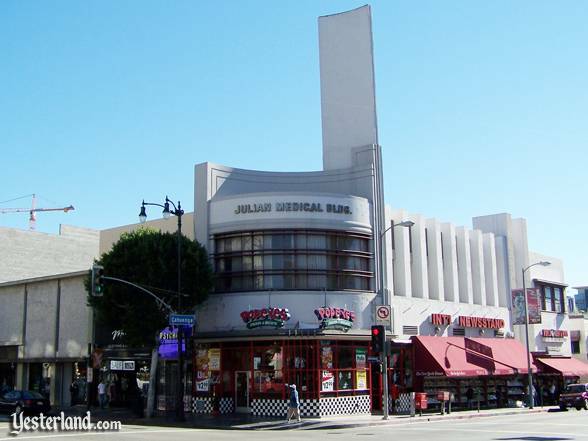 Photo of former Owl Drug (Julian Medical Building) in Hollywood: 2007 by Chris Bales.